How many remotes do you have? I have one for the TV, another for the DVD player, a third for the stereo, and yet one more for the VCR. 4 remotes = 1 crowded coffee table. With the OmniRemote by Pacific Neo-Tek, I can clear my table and control every component of my entertainment system with my Visor. The OmniRemote is a standard-size Springboard module, similar to the InnoPak/2V , with the exception of a small emitter that sticks out less than 3 mm above the Visor. 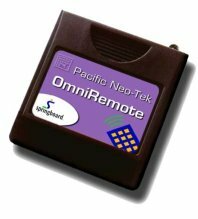 The OmniRemote is graphite in color and has a purple label that matches Pacific Neo-Tek's colors, and it can control components at much greater distances than the Visor's internal Ir can. The OmniRemote installs two applications onto the Visor: Remote and Manual. Remote is where all the action is, while Manual has full instructions for using OmniRemote. I really like the fact that the user's guide is on the Visor, as it makes a complete package. Most other software help is comprised of .PDF files that can only be read on a desktop computer, which does not help you when you are away from your desk. When the OmniRemote is removed, the applications are also removed, while the remote data remains on the Visor. Training the OmniRemote is somewhat easy. First align the remote and the Visor so that the Ir Port is in front of the remote, then set the Mode to Training and then tap the button to be "trained." You will then see an "Align your remote screen." At this prompt, press the button on the remote -- you will hear a click. Tap the screen on the Visor to go to the programming screen and then press the remote button once quickly; repeat for the remaining buttons. For my testing, I "trained" OmniRemote to replace the remotes for the TV, DVD player, VCR and stereo. All but the VCR are made by RCA. For the DVD player, I had to create most of the buttons because it was not one of the included configurations. The remaining remotes already had pre-made buttons for them. Creating buttons is pretty easy, although you have to work with an invisible gridline that the OmniRemote uses for button spacing. When creating buttons, you will need to decide which particular remote buttons you need the most, as the Visor's 160x160 screen limits the number of buttons that can be made. Size: 4 1/8" x 2 5/16" x 5/16"